This page (written in 2003) provides some geological background for Oxford Brookes University's Ecology field course to the Cévennes. 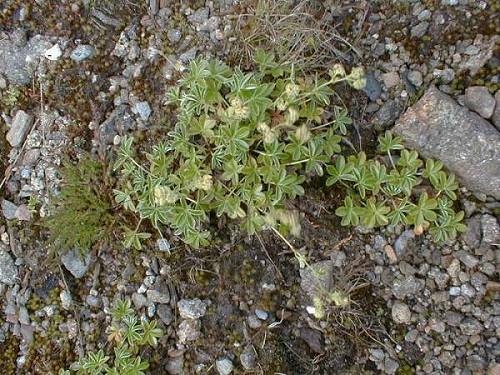 Mont Lozère is a large upland region in the southeast of the French Massif Central. 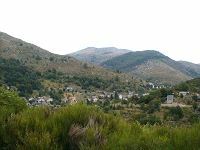 It is part of a northeast-southwest trending mountain range, the Cévennes. This range forms part of the Mediterranean-Atlantic watershed. West draining streams join rivers such as the Lot and the Tarn which drain to the Atlantic. On the east and southeast sides of the range, streams drain into rivers which join the Ardèche and the Gard, part of the Rhône drainage system which flows into the Mediterranean through the delta of the Camargue, an important wetland habitat. basement rocks are also found at depth beneath all the cover regions. 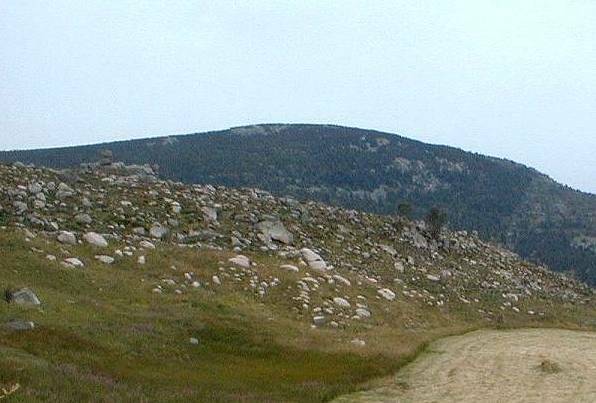 The Mont Lozère region is part of an ancient mountain range, the Cévennes. 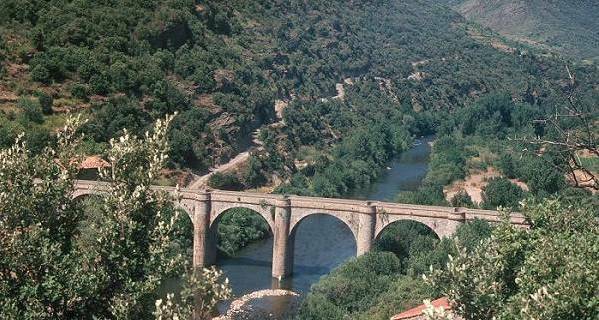 The Cévennes, in turn, are just the southeastern part of a much larger fragment of an ancient mountain belt, the Massif Central, which forms a large upland area across much of the centre of France. The mountain building event was a result of continental collision, ending in Late Carboniferous times, some 290 million years (Ma) ago. Other parts of this vast ancient mountain belt are found in Brittany and Normandy (the Massif Armoricain), and in southern Britain. This Variscan (or Hercynian) Mountain Belt extends into Spain and eastern Europe and, westwards, into the Appalachian mountains of eastern North America. Two main rock types are found in the basement: granites and metasedimentary rocks such as schist. 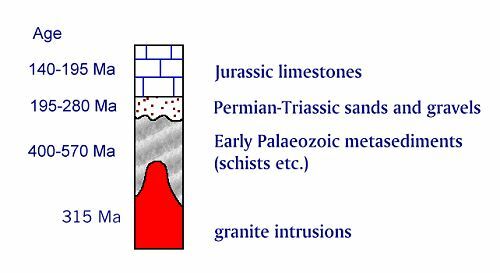 The metasedimentary rocks are older: they were originally sediments deposited in marine environments during early Palaeozoic times (~ 570 - 400 Ma ago). These deposits of mud and sand were probably thousands of metres thick, and deposited in subsiding basins. Later, as they became involved in intense folding and heating during mountain building, the mineral composition of these rocks was changed by heat and pressure. The clays in the mud rocks changed to mica, forming a characteristic sheen on folded surfaces in the resulting metamorphic rock: schist. Some of the deeper rocks were heated sufficiently that they started to melt, around 315 Ma ago. This resulted in the intrusion of large bodies of granite at depth. The granites cooled slowly, allowing large crystals to develop. In the later stages of cooling, hot water circulated through the granite and surrounding rocks, forming mineral veins, some of them bearing metal ores including gold. 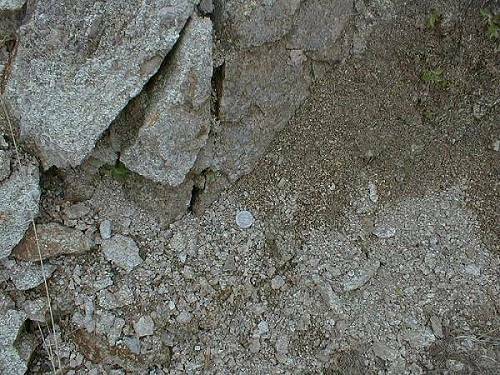 Schist scenery: this is rather subdued, with less outcrop than on the granite areas. Schist is relatively soft. View north from north side of Mont Lozère. Shiny, folded foliation surfaces in schist. 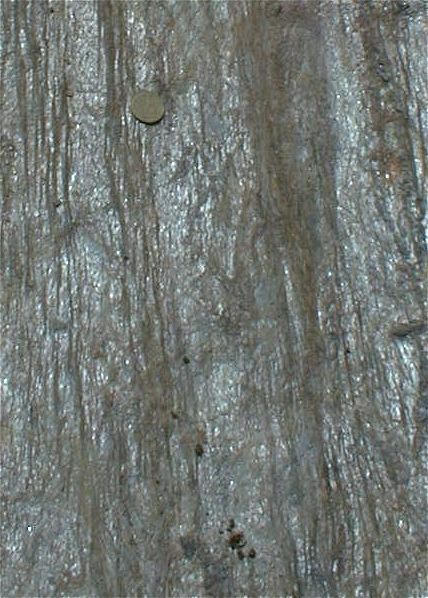 The almost metallic silvery look of this surface is due to the presence of small crystals of muscovite mica, all oriented parallel to the surface. (Near Chalet de Mont Lozère). Coarse granite from south of Col de Finiels. 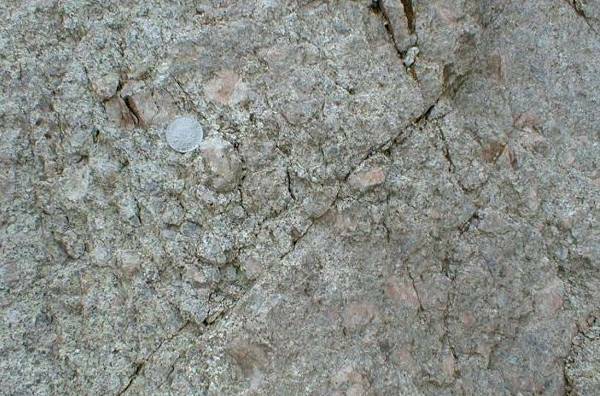 Note the large white feldspar crystals, which give the rock a very distinctive appearance. French geologists refer to this as the granite aux dents de cheval - granite with horses' teeth! 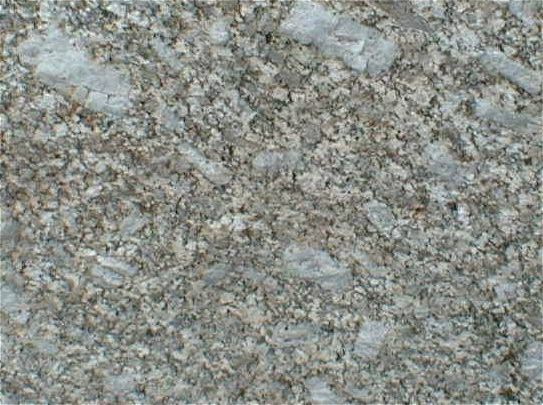 A closer look at the above granite. Large white feldspar crystals are obvious, as well as smaller crystals of a different, pink feldspar, and small black flakes of biotite mica. 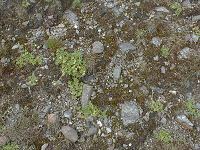 Quartz, a hard glassy mineral which is an essential component of granites, is present but not easy to see in this image. The minerals in granites are formed at high temperatures, and most of them are not particularly stable at the earth's surface. Here, weathering is breaking down the feldspars to yellowish coloured clays, and the rock is disintegrating. 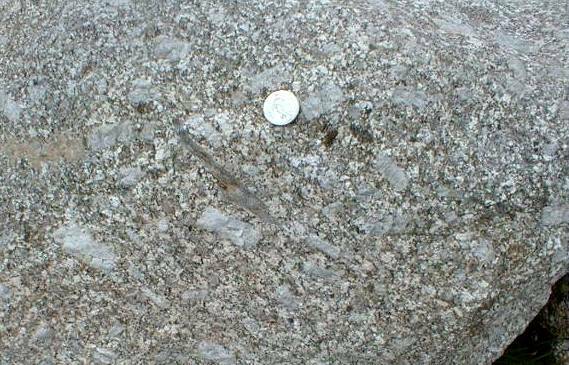 In this granite near Le Pont de Montvert, the large feldspars are pink. Quartz is stable, and is often all that remains after the intense weathering of granite. In this road cutting near Le Pont de Montvert, the granite has broken down by weathering to form a sandy, acid soil. A closer look at the gravel formed by chemical breakdown of the granite during weathering. Poor acid soil developed on the granite, south of Col de Finiels. This simplified map gives some idea of the complex relationships between the different rock units. The 'cover' rocks have a sedimentary contact with the older rocks - they were deposited on an ancient landscape sculpted in the 'basement'. Later earth movements have resulted in faults (thick black lines), along which all three groups of rocks have been displaced. 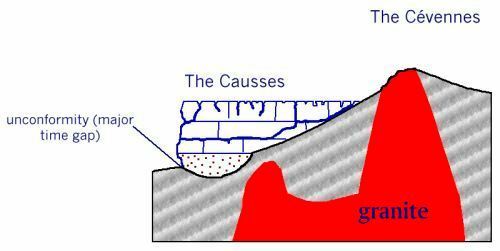 Erosion has isolated parts of the limestone cover, which was originally much more extensive. 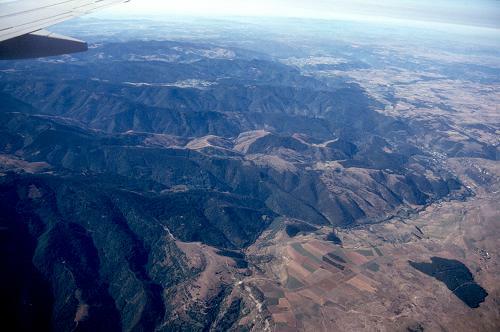 Aerial view, looking south, of the contact between the older, folded Palaeozoic sedimentary, metamorphic and igneous rocks of the Cévennes mountains, and the almost undeformed younger Mesozoic limestone plateaux (les Causses). The two regions are separated by an unconformity representing a long time gap. 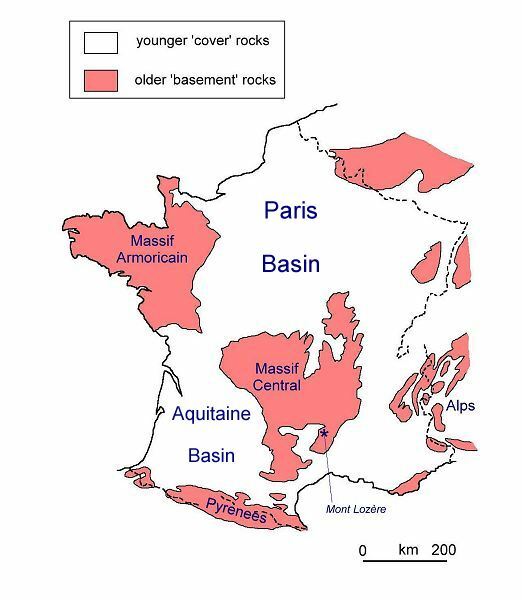 The basement of older rocks forms a foundation on which younger rocks were later deposited in major sedimentary basins, such as the Paris Basin and the Aquitaine-Languedoc Basin. Even whilst the mountain belt was still forming, it was being eroded by normal sedimentary processes. This continued after mountain building had stopped, and for much of Permian and Triassic time (280 - 195 Ma), the products of this erosion were deposited in the lower lying parts of the old mountain belt, infilling sedimentary basins with sands and gravels, and burying the old landscape. The contact between these younger rocks and the basement represents a major time gap - it is a landscape unconformity. The contact between the basement and the cover, just outside Florac. At the foot of the road cutting, the red rocks are deeply weathered schists close to the unconformity. 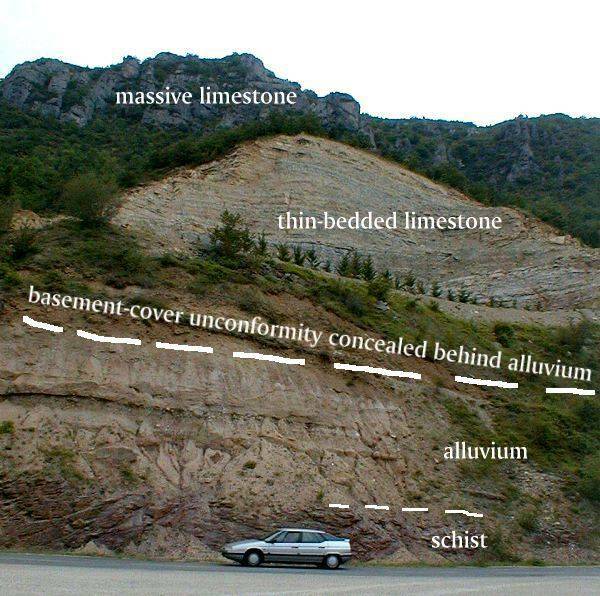 The bedded material above this is young alluvium (the deposits of the Tarn, behind the camera), concealing the unconformity. In the quarry are thinly bedded limestones and mudstones (late Triassic or Jurassic), overlain by massive Jurassic limestones forming the steep cliff and the limestone plateau above. Towards the end of the Triassic period, sea level rose, and the region started to become submerged. For much of Jurassic time, marine limestones were formed in this area. There was no longer a major input of fragmental material from the now worn-down mountain belt, and the limestones resulted largely from the secretion of shells and skeletons by a variety of fauna and flora in clear, warm, shallow seas. 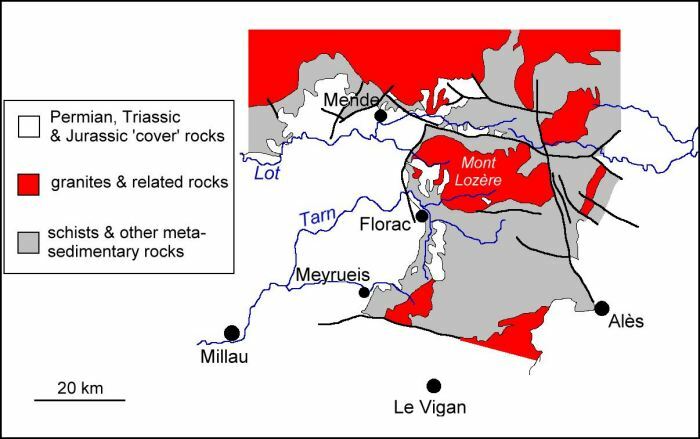 At this time, it is likely that higher parts of the Cévennes stood up as islands in the Jurassic sea. Marine conditions continued into the early Cretaceous. In late Cretaceous and early Tertiary times, another mountain building episode occurred. This was the Alpine orogeny, resulting in the formation and uplift of the Alps, Pyrenees and a number of other mountain belts around the Mediterranean as a result of continental collision as the Tethys ocean closed (the Mediterranean is a small remnant of this large ocean). 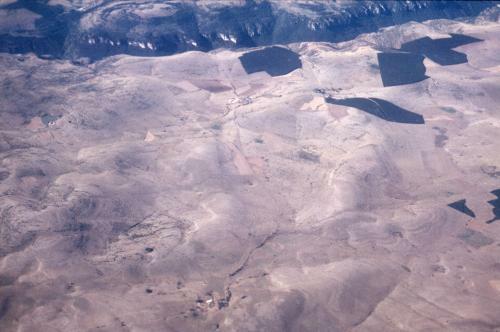 The Massif Central acted as a rigid block during this time, protecting the younger cover sediments from severe deformation (unlike their counterparts in the Pyrenees, which are strongly deformed). Most of the cover rocks found in the Massif Central area are still relatively horizontal, as they were deposited. 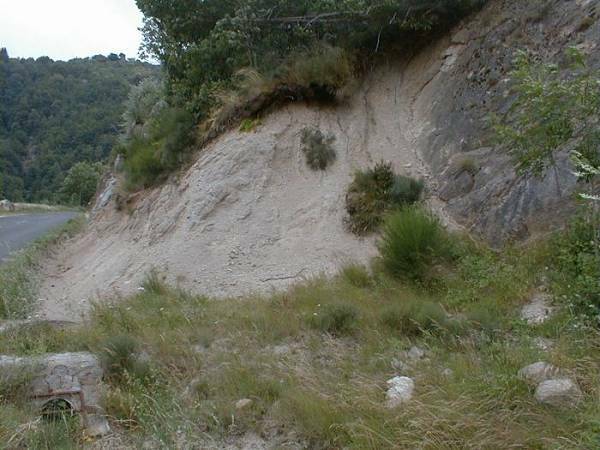 Some have been tilted and displaced by later faults (some of these related to the opening of the western Mediterranean in Tertiary times), and they show folding in places. Weathering and erosion since Tertiary times have led to the present landscape. The Jurassic displays the bare limestone plateaux of the Grands Causses. The limestones are particularly prone to solution weathering from naturally acid rain, and this has produced features ranging from limestone pavements to karst pinnacles and large cave systems. 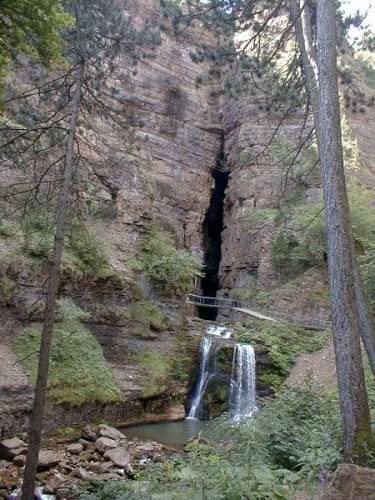 The main rivers of the area, such as the Lot, the Tarn and the Jonte have cut down through the limestone plateaux to give the spectacular gorges we see today. 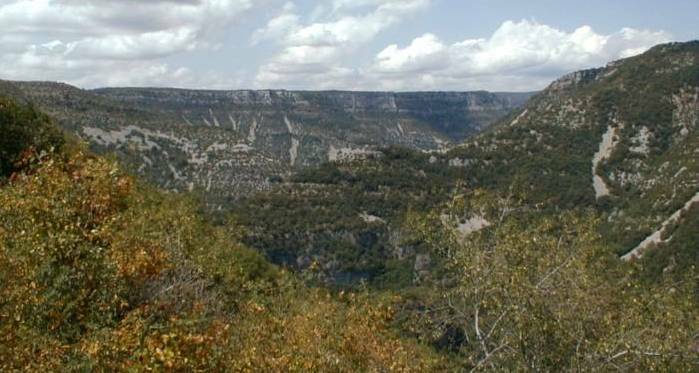 A typical view of the limestone plateaux of the Grands Causses. Horizontally bedded limestones form a stepped cliff profile in the gorges which have been eroded by rapid downcutting of the rivers. Vis Gorges, cutting through Causse du Larzac. Close-up of thinly bedded limestones and mudstones (? Upper Triassic) on the Lot, west of Mende. Layers are displaced by a minor fault just right of centre. 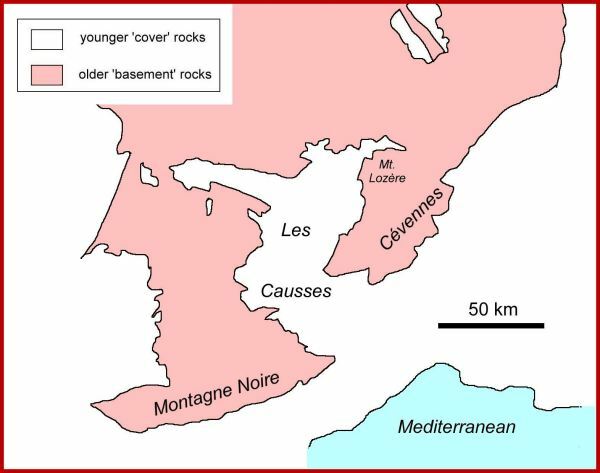 Cave system developed along vertical fractures in the Jurassic limestones of the Causses. The Bonheur river re-emerges here, after flowing through the Abîme de Bramabiau, southeast of Meyrueis. 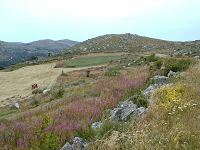 View of the sparse vegetation on top of the Grands Causses. 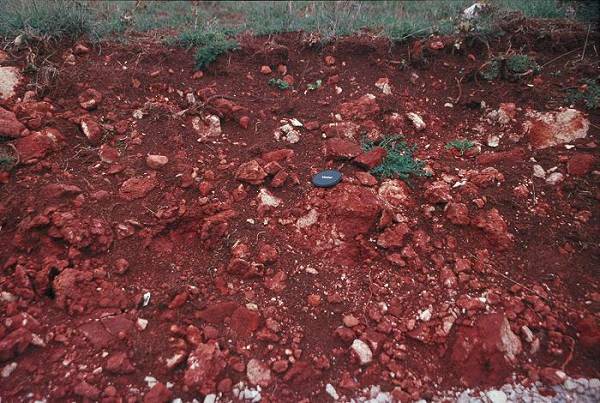 In the foreground is the thin red soil which overlies the limestone. 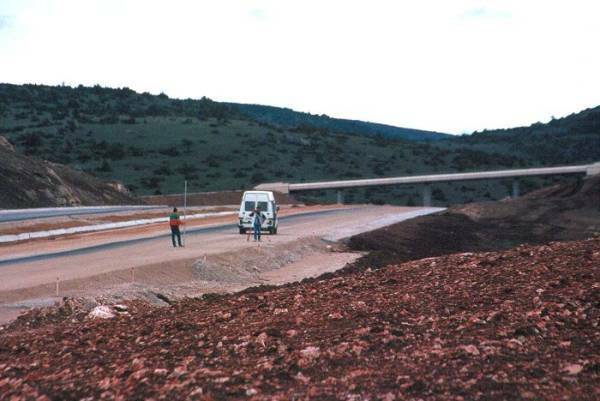 Photograph was taken during construction of the A75 motorway. Close-up of thin red soil on Jurassic limestone. Note: this page was written to give geological background for an Ecology field course. It should not be taken as a rigorous geological description of the area. This page is maintained by Roger Suthren.